A CASE OFNATURAL FOREST RESOURCES MANAGEMENT AND AGROFORESTRY CENTRE (NAFRAC), SHINYANGA. 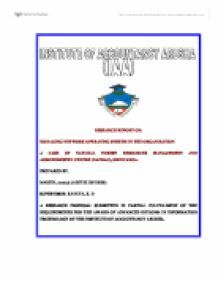 A RESEARCH PROPOSAL SUBMITTED IN PARTIAL FULFILLMENT OF THE REQUIREMENTS FOR THE AWARD OF ADVANCED DIPLOMA IN INFORMATION TECHNOLOGY OF THE INSTITUTE OF ACCOUNTANCY ARUSHA. This research is about Management of network operating system at Natural Forest Resources management and Agroforestry Centre (NAFRAC) in Shinyanga, Tanzania as the case study. It has been conducted for 16 weeks at effective from the 1stOctober, 2007 to end of January, 2008. A case study method was used because the study was at a single unit and it is less expensive compared to other methods such as survey. The findings are presented in relation to the research questions, while analysis of data presented in relation to the proposed methods which are both qualitative and quantitative, with figures and tables by using scientific packages for social science (SPSS) & Microsoft excel (Version 2003).Data was interpreted in relation to the objectives of the study. The researcher gave a conclusion in relation to research questions and data interpretation against objectives of the study, and finally the researcher provided some recommendations for any management or mismanagement of networks revealed at the NAFRAC for corrective measures. The study finding shows that network operating system is not centralized at NAFRAC. Instead the NAFRAC uses workgroup connections so as to make networking at the NAFRAC. Peer to peer networking is not a centralized system in such; it is a system which enables sharing of printer and other resources but not from the server. Kernel doesn’t deal directly with users, instead it starts up a separate interactive program called shell for each user when she/he log in. The shell act as interface between user and the system. A shell enable user to interact with resources of computer such as programs, files and devices. Shell is a command interpreter, takes the user commands and set them for execution. These kernel and shell collaborate to provide user with UNIX services and handle any resulting output from the operating system. This is powerful and commonly used variant of UNIX operating system. It is popular because it is a freeware and can be downloaded from the internet .It’s reduced version of UNIX offering almost all features available under UNIX such as multitasking, virtual memory management and TCP/IP networking.This owns on multiple hardware platform and applications available on this system are growing very fast, it is extensively used by ISPs. Cost - The most obvious advantage of using Linux is the fact that it is free to obtain, while Microsoft products are available for a hefty and sometimes recurring fee. Microsoft licenses typically are only allowed to be installed on a single computer, whereas a Linux distribution can be installed on any number of computers, without paying a single dime. Security - In line with the costs, the security aspect of Linux is much stronger than that of Windows. Why should you have to spend extra money for virus protection software? The Linux operating system has been around since the early nineties and has managed to stay secure in the realm of widespread viruses, spyware and adware for all these years. 2. What type of Network operating system the centre use? 3. Whom one manages installed network technology and network operating system within the centre? 4. Do you have server(s) in the centre? 5. Which of the following is the type of network media do use in the centre? 6. Do you have local area network in the centre? 7. Which kind of network technology do use in your centre? 8. How many computers do you have in the centre? 10. Do you think there are any advantages of use network operating system in the centre? 11. Do you think there are any disadvantages of use network operating system in the centre? The chart below shows the budgeted time for each activity whereby it take sixteen (16) weeks i.e. from 1st October 2007 up to 31st January 2008 to complete the research activities and report submission. Table 5: Schedule of Activities. Budget break down: The chart below shows the budgeted time for each activity whereby it take sixteen (16) weeks i.e. from 1st October 2007 up to 31st January 2008 to complete the research activities and report submission. DO Implement and operate the ISMS policy, controls and processes. CHECK Assess and measure process performance against policy and objectives. ACT Take corrective and preventative action based on the results of ISMS audit, management review or other relevant information to enable continuous improvement. > Installation and configuration of the database server. > Design and implement the network > Design and install the required hardware and software to build the network. > Creation of a security plan suitable for the schools network. This will include creating access limitations and appropriate login restrictions for both the students and staffs. It ensures complete data transfer. The transport layer passes the data between the network and the session layer. * Layer 3: Network This layer handles the routing of the data sending it in the right direction to the right destination on outgoing transmissions and receiving incoming transmissions at the packet level. The potential of a good quality system is high in SSADM due to a quality level being clearly defined at the beginning, and constantly checked throughout the development of the project. SSADM also separates the logical and physical design stages, thus ensuring the system's design can be implemented over again with new hardware/software. These networking products are used to connect both WANs, wide area networks, and LANs, local area networks. Large scale product solutions exist for corporations, governments, and universities while smaller solutions are available for individual consumers. Two main markets exist for network equipment industries, a telecommunications or service provider market and an enterprise or datacommunications market. Decent amounts of video and motherboard-based RAM are compulsory for these users as they deal with multimedia applications daily and create dynamic content for both print and web purposes.